Where Will You Find A Mintmark On A Coin? Since a mintmark is an identifier for each coin and will tell you where your coin was minted, it stands to reason that you will find the mintmark somewhere on the coin itself. And this is where it might become slightly messy. Yes, the one thing that you can rely on is that a mintmark will be on a coin, or can you? What about when there is no mintmark? What then? There are of course as things go in this world, a few reasons for this. There is no mintmark used for that particular mint. This can happen because the mint is the original one and therefore doesn’t use a mintmark, or perhaps the coins minted elsewhere weren’t given the mintmark on purpose. For example Lincoln cents which were minted at both the San Francisco mint and the West Point mint in the early 1990’s didn’t use a mintmark, thus making it indistinguishable from the Philadelphia minted Lincoln cents. 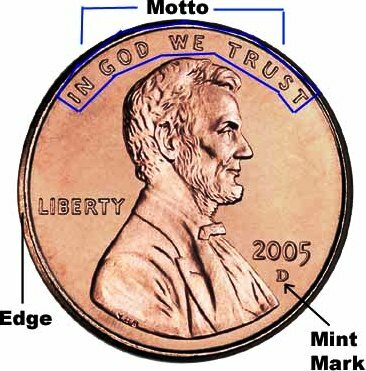 There was something wrong with die or grease got clogged up in it and covered the mintmark symbol, thereby resulting in a coin with no mintmark or a very weak mintmark, or the mintmark has been carefully scraped away for fraudulent reasons at some point or other. Since some coins are rarer than others and sometimes the mintmark or the lack of one is the main reason, the mintmark will be carefully removed to give the appearance of having no mintmark at first glance, Or It could have worn away naturally with the passage of time. If there is a mintmark present on the coin however, you would as a general rule, find it on the obverse of the coin. That’s not to say that whichever side you find a mintmark is going to be the obverse of a coin. No, it’s more along the lines of the mintmark being placed on the obverse. This too can change however, and you might find that some mintmarks are actually on the reverse of the coin. A good example of this is the nickel. Whereas normally you would find the mintmark of the nickel (five cent piece) just under the date as with most US coins, during the heyday of the Second World War, there was a shortage of the metal Nickel which was used to mint the coins. This led to silver being added to its composition and to reflect this change, for the duration of this time, the mintmark was taken over to the reverse of the coin. The placement of the mintmark can also vary from country to country, from coin to coin and from whim to whim. Well not really from whim to whim as it does take a committee or an organization to make these decisions but you can’t get around the fact that the placement is entirely in the hands of these capable people. So again generally, you would likely find a mintmark somewhere under the date if there is one, which is the case for just about all US coins. Otherwise, in times gone by and in other countries, you could find the mintmark in such place as just under the portrait of a ruler, just to the side, or just above. Then you also have the variation of the mintmark being just above the date, or just above the date and just under the portrait. As you can see there are many variations on this theme, and the only way to know for sure is to first know what the possible mintmarks are for that country and that coinage. And also whether there was a mintmark to begin with. Previous story How To Make Money From Foreclosures? How Vital is Building an Emergency Fund? Your use of the nickel as an example is good, but there is more to it: the mint mark appeared on the reverse of the coin from its inception to 1964, and in 1968, when mint marks were reinstated, it was moved to the observe by the date. The exaggerated mint mark used during the WWII era were to differentiate the silver nickels from the non-silver, as the change occurred in the middle of 1942. Does the absence or presence of mintmark affects the value of the coin?